Finishing up the year with a bang! 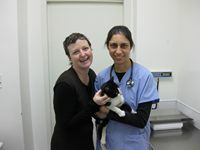 Yesterday, Feral Fixers brought in seven more cats to the PAWS-Chicago Spay/Neuter clinic to be fixed. I brought the cats in, in the morning, while super-volunteers Danielle and Lauren picked them up and brought them back to Tammy's for recovery - Thanks Danielle! Thanks Lauren! As with the last batch of cats brought in, all of these cats were 'friendly ferals' - it's just too cold to be trapping feral cats right now. With these seven cats, the last batch of the year, Feral Fixers has processed 75 cats for the month of December, 1,002 for the year and 2,481 overall.